We truly care about the health of your eyes! For 50 years, Dr. N.W. Davis has examined, diagnosed, treated and managed diseases, such as glaucoma, minor eye injuries, foreign bodies, and inflammations in and around the eyes. Most people go to the dentist twice a year but, yet, don't go to the eye doctor regularly. Can your eyes be replaced like teeth?!? Many eye diseases don't hurt or affect your vision until it's too late. With our state of the art equipment we can detect over 1800 diseases. You only have two eyes, and they are irreplaceable! 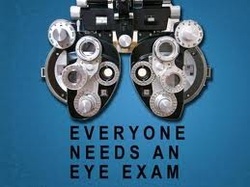 EVERYONE NEEDS an EYE Exam, once a year!